As regards the Turks under a putative Sunni demagogue Rycyp Erdogan I can only think with friends like these who needs enemies. Turkey’s New Ottomanism foreign policy has been a disaster and perhaps should be alternately known as Neo Byzantinism in view of the double dealing and continued deception.in regards to Turkey’s relationship with extreme groups in Syria. I personally witnessed the facilitation of the foreign jihadi fighters that make up the Katibas of Al Nursra, Al Sham and ISIL while working as a journalist in Antakya, as recruits from the Magreb Chechnya and Europe were granted free passage through South East Turkey into Aleppo and Idlib province across the border in Syria. Not only were they allowed to come en masse to meet with recruiters, they were able to cross back and forth for Rest and Recreation and medical treatment in Antakya. Meanwhile local traders did a roaring trade in non lethal military kit. Others in the back street tea houses and coffee shops steered the way to illegal arms. While princes and sheiks from Qatar rolled up in armoured Limos with entourages of imans and bodyguards to disburse millions of dollars to residents of Syrian refugee camps while espousing anti Assad Israeli and Shia rhetoric as their price. One can only speculate if the dollars went on recruitment for the fight against Assad, but then again neither was there evidence that the conditions in the camps improved significantly either. This was 2012 since which time the province around Antakya with its large Allawi and Arab population has been teetering on the brink of revolt . The local Allawites or Allevis many with relatives across the border in Syria mostly support Assad and are not afraid to tell you so. There were already pre existing tensions with local Turkish Sunni moslems who were brought in to the area by Attaturk before the second World War in order to make up the numbers of Ethnic Turks voting yes to annexation by Turkey. The plebiscite was offered by France who then ruled over Greater Syria following the collapse of Ottoman rule after the first world war. It was 1939 and the French were eager to bring Turkey into the war against Nazi Germany. Understandably Turkey has been vociferous against Assad’s atrocities against Syrian civilians, but was muted when its alleged proxy ISIL has been deliberately and systematically conducting brutal genocide against Yazedis Shia’s and Christians . It has condemned Russia’s bombing campaign and seen to be lukewarm in its pursuit of ISIL preferring to target Kurds who are directly fighting ISIL . And now we have the most positionally suspect NATO member downing a Russian Jet with the death of its two pilots. Most worryingly one of the pilots seems to have been killed by yet another of the Turks proxies anti Assad Turkmen paramilitaries. The gruesome displaying of the pilot’s body in the usual display of triumphalism by these groups will not play well on the world stage least of all in Moscow. If it transpires that the jet was brought down on the border or inside Syrian airspace it denudes Ankara of any fig leaf in relation to their real policy intentions of protecting their proxies rather than joining in a untied front against extremist militant groups fighting Assad. f that is the case Turkey can expect to find itself at the wrong end of Russian trade and foreign relations. However if Russia deems its plane was well inside Syrian airspace then Turkey must face some sort existential military response from Russia. If that is the case, Governments in the West and NATO would be well advised to steer clear of supporting Turkey in what is a situation all of its own making and against the wider policy aims of the West and its allies in the Middle East and the wider world. Countries like France, UK and even the USA, will hopefully see that Russia is a more valued ally in the fight against a common enemy than a double dealing Turkey, self serving its own nefarious regional policies and interests. The fate of Donetsk,city of one million, rests in hands of a 26 year-old commander recruited by social media. All out war and humanitarian disaster looms dangerously close with increasing hardships for residents. Two years ago Donetsk was playing host to thousands of England football fans during the European Championships, today this city of one million is teetering on the brink of an all out war. As the battered remnants of self styled Separatist commander Gregor Strelkov’s fighters retreat from Slaviansk and regroup in this formerly prosperous industrial city, normal life is beginning to fall apart. Water is restricted to 2 hours a day due to bomb damage to filtration plants, interruptions to electricity and internet services are becoming more frequent and lasting for longer. Supermarkets are refusing credit card transactions and cash is no longer available from the cash machines. The few banks that remain open do so for only two hours a day. One family told me they were visited by soldiers of the DNA who ransacked the house and stole 50, 000 Ghrivnas around £2500. They did what the rebel army has advised residents to do in case of a complaint about the conduct of separatists soldiers – they called the emergency hotline . Within a few minutes officers and troops from the DNA arrived at the family’s house in time to catch their colleagues who were leaving. Instead of the first group of soldiers being arrested and the money returned as the family had hoped the second group decided that the family could have their money returned if the father and eldest joined the Separatist Army if not the money would be their contribution to the war effort. The family decided on the donation. Worryingly for residents this type of incident along with car hijacking to facilitate rebel troops with transport is on the increase. Donetsk a coal and steel town (think a Soviet era type Sheffield) founded 150 years ago by a Welshman, John Hughes, is the centre of the self proclaimed Donetsk Peoples Republic, following the violent takeover of the regional administration building in April. Pro-Russian rebels went further after a referendum in May (not recognised outside the region) which the rebels say returned a majority of votes in favour of independence from Ukraine. The Donetsk rebels linked up with the neighbouring region of Lughansk to declare the confederation of Novo Russiya (New Russia). In the interim Ukrainian forces have been slowly and painfully attempting to bring the region back under their control. The countryside and towns around have seen increasing fighting that has so far claimed at least 500 civilian casualties and countless more numbers of rebel fighters and loyalist Ukrainian troops. 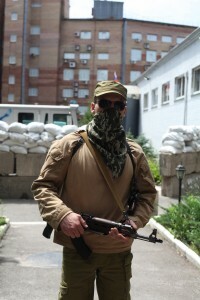 Speaking exclusively to me from with the barricaded rebel stronghold in the former Interior Ministry Police HQ the commander of the Orthodox Battalion of the Donetsk Peoples Army 26 -year-old Dymytry Boytsov (Nom de Guerre) said: “ Our aim is not war but we stand ready to defend the people from the Kiev Nazis who are coming with their alien ideology, they want to impose different cultures and traditions on us. “We are Russians by nature, we want to defend religious freedom and the multi national background of the region. 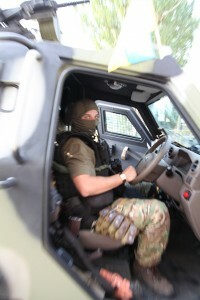 The fate of Donetsk and its one million inhabitants now rests with this militarily inexperienced young man his face hidden behind a camouflage mask for fear of reprisals. Dimitry openly admits to having little combat experience apart from that gained in the recent takeover. In fact he says he became involved in the separatist movement via the VK social media network the Russian equivalent of Facebook. What about the safety of the civilians who will be caught in the crossfire and bombardments? Rather casually the Commander answers: “ We will try to defend the civilians and facilitate their safety with instructions and advice. “We do not want to be sold to the USA ! Why is it only Nazi people are helped? Why is there no help for the Russian people. “The world’s media says we are being supplied by Russia with heavy weaponry – that is not true- where are the heavy guns from Russia? We have only light weapons that we took from the armouries of the Ukrainian Police”. As we leave the Separatist’s stronghold in the HQ of the former Ukrainian Secret Police (SBU) reinforced with sandbag dug outs and concrete blocks, a car backfires and my young female interpreter freezes in fear. “Its alright its just a car! a sentry shouts as she allows herself a nervous laugh. Following our two hour interview we headed into the city centre to enjoy some respite from the tension of the possible looming catastrophe. The bars, restaurants, cafes and shops that adorn the wide boulevards of this pleasant city and have just enough customers to give the impression of normality. Despite the armed Separatists manning the roadside checkpoints, the water shortages, power cuts and constant threats from the Kiev Government that the attack will come very soon, life goes on… just. However something will have to give, the Ukrainian Army will build up its forces outside the city after clearing the separatists from the key strategic towns of Slavyansk and Kramatorsk to prepare the ground for the final assault on its most important objective. If the rebels reject Ukrainian President Poroshenko’s peace plan with its offer of safe passage into Russia , then there is no alternative to a bloody battle that will add to the growing list of casualties. That will turn the stream of 34,000 refugees from war torn areas into a deluge numbering the hundreds of thousands. Thats when the inexperienced Commander Boystov of the Orthodox Battalion will have to quickly learn the full challenge that his decision to remain in his city HQ will bring on the 900 fighters and one million inhabitants under his control. There is no doubt if the separatists do remain embedded within the city then the consequences for the civilians trapped there will be horrendous. Ends.